In this series, I will be looking at what pets are the most popular among overlords. I will give an overview of what your best pet options are. Today, we’re looking at Storm! This article is based on the data I’ve collected in November and December of 2017. I collected screenshots of the pets of a total on 307 overlords. However, when divided per school, the data is too limited to draw wide conclusions about the subject. 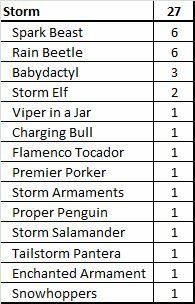 Storm overlords are fairly rare unfortunately, so we have a small number of Storms: only 27. As such, where the data isn’t complete, I will add my own pet suggestions. Of the Storm overlords I found, six were using a Spark Beast. All six were Legendary wizards. Why is an Spark Beast a Good Pet for Storm? This is probably another case of how accessibility influences pet choices: the Spark Beast is probably one of the easiest pets to get a hand on. Its item card, a Stormblade, is useful at any level and with any strategy. Granted, Storm doesn’t have much options for strategies other than going offensive. Another six Storm overlords picked a Rain Beetle to accompany them in PvP. Four of those overlords were Champions, one a Legendary and one a Magus wizard. 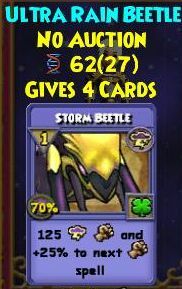 Why is the Rain Beetle a Good Pet for Storm? The Rain Beetle comes with FOUR item cards! That’s four more spells to fizzle, woohoo! 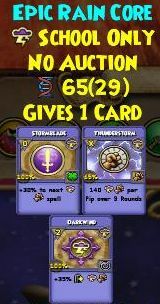 This spell perhaps works best at levels where your accuracy is a little higher, because the Storm Beetle attack this pet provides has only 70 % accuracy. However, it’s a very useful card as it allows you to both break an shield and cast a blade at the same time. Three Babydactyls made it into my screenshots. Their owners were a Legendary, a Prodigious and a Champion Storm overlord. Why is the Babydactyl a Good Pet for Storm? The Babydactyl is like an improved combination of the previous two pets! It comes with a Stormblade item card, just like the Spark Beast, and with a Storm Beetle item card, just like the Rain Beetle. 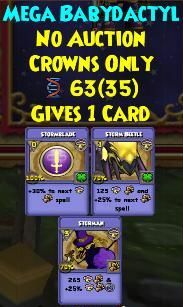 In addition, it has a Storman item card, which hits for 265 damage and adds a Storm bubble. Those are three awesome utility cards for Storm! I found two Storm Elf pets, carried by a Legendary and an Archmage Storm. 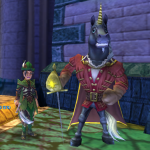 Why is the Storm Elf a Good Pet for Storm? Storm Elf is a two pip attack that does damage over three rounds. Storm doesn’t have many other ways to deal with shields, so this pet can come in very handy. Unfortunately it only gives one item card. I guess Storm will have to keep depending on the TC version! There was one Viper in a Jar in my data. 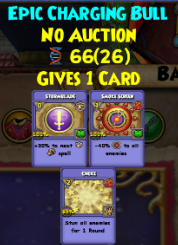 I didn’t even remember this pet existed before I ran into the Legendary Storm overlord that was using it. Why is the Viper in a Jar a Good Pet for Storm? 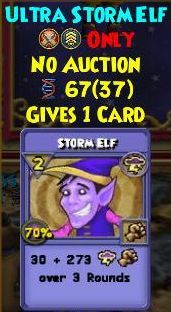 This pet gives one item card that works similarly to Storm Elf, but does more damage and costs 4 pips. This Stormy version of Death’s Poison is a pretty cool addition to all the spells available in the Spiral! Is it better than the Storm Elf? Debatable. Is it cooler? Certainly! I found one person with a Charging Bull. He was an Exalted Storm overlord. Why is the Charging Bull a Good Pet for Storm? I feel this pet would do best in team PvP, if you want to utilize all its cards. The Stormblade is of course useful in any type of PvP, but the other two cards are less useful in 1v1. First, there’s a Smoke Screen (accuracy debuff for all opponents) item card and, second, a Choke (stun for all opponents). This pet is an honorable mention, as I didn’t find any Storm overlords using a Rain Core. Why is the Rain Core a Good Pet for Storm? If you’re looking for a pet which gives a blade, you might as well choose one that also gives something else! The Rain Core gives, in addition to its Stormblade, a Thunderstorm (ooh, fancy) and a Storm damage bubble. Not a bad pet by far! 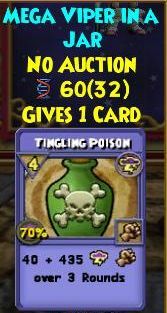 Do you know of another good Storm pet?